“Arrgh Ye Scurvy dogs! Time to come to A few years ago, I had the pleasure of working as a camp speaker and pastor for the Middle school camp at the Christian camp, Westminster Woods in Northern California, known as “Buccaneer camp.” To be in Buccaneer camp, we had to occasionally imitate pirates- I would sometimes talk with a gravelly voice and wear a bandanna, that sort of thing, just to make the theme seem more real to the campers.campfire!” You get the idea. In addition to speaking each night at campfire, one of my other responsibilities was to have a morning devotional Bible study for the camp counselors. I tried each day to motivate them to show God’s love to their campers. In the middle of the week, I happened upon the passage from Ephesians 5:1-2-“Therefore be imitators of God, as beloved children. And walk in love, as Christ loved us and gave himself up for us, a fragrant offering and sacrifice for God.” The counselors, most of them teens, seemed a bit tired and unenthusiastic that morning. So I decided to wake them up a bit. I asked how many of them did imitations. A few meekly raised their hands. I then asked, “How do you prepare to imitate whomever it is you are trying to impersonate”? “You have to think of who they are, get into their character,” one counselor replied. “Right!” I said. I then proceeded to do launch into my Arnold Schwarzenegger impersonation. (Does impersonation) That woke them up! I told them I had to think and act like Arnold in that moment so that I could be like him, and then encouraged them all to think of and be imitators of God to their campers that day. Rich Little was kind of the trailblazer on impersonating famous people back in the 1960's. Now there are hundreds of thousands of people who earn a living imitating others. For example, go on the internet and search for an Elvis impersonator, and you’ll find at least 897,000 listings from all over the world. One of them is an old friend of mine whom I performed with on stage decades ago. I never knew he wanted to be the King. (Thank you very much.) Those who impersonate someone else often do so because they looked up to them in some way. Some of them pattern their lives after the one they impersonate, dressing and talking like the star they impersonate, even off camera-even going so far as to get plastic surgery to look more like the one they are impersonating. Impersonation becomes imitation, a pattern for living. And Imitation is, as they say, the sincerest form of flattery. In this letter to the church at Thessalonica, Paul believed the church there was doing a wonderful job of imitation, flattering Jesus Christ in how they acted and spoke. He paid quite a compliment to the church, which he gave to no other church in any of his letters in the New Testament; he praised the members for their exemplary living. He called them great imitators of both Paul and more importantly Jesus Christ himself. He thought of the Thessalonians as an example, not only to people of no faith but also to Christians throughout Greece. The Greek word for example, tuphos, also means pattern - this word denotes a model or mold or the impression made by a stamp. It came to be used to describe the process of making a coin. One coin looked like the stamp from whence it came. Paul used this example for the church in Thessalonica, for they had patterned their own lives after Paul, and after Christ. They looked like Christ because they came from the same stamp-modeling their lives after Jesus and his teachings. Paul says that they did so under much affliction. In the book of Acts, in Acts chapter 17, we find that when Paul came into Thessalonica, his work to establish a new Christian community was met with rioting in the streets and accusations before city officials. Paul and others were hauled before the city leaders and were accused of worshiping a king other than Caesar, breaking the law. It wasn’t easy to imitate Christ in this Greek city that was hostile to the faith and was an important trading center and the capital of Macedonia. Despite their hardship and affliction, they became an example to be followed, to be imitated. The converts had followed the example of their mentors; they had become imitators of Paul and, because Paul and others had modeled themselves on Christ, they too became imitators of Jesus Christ himself. This is the historical order of mission work in Paul's epistles. Paul the missionary must show the new way in his life as well as in his words. His converts will begin by imitating him, learn about Jesus through his teaching and example, and go on to imitate his Master. He had no Bible. So this is how faith in Christ was handed down in the first century. Paul also used this model in the church in Corinth, when he told the Corinthians: “Therefore I urge you to imitate me (1 Cor. 4:16) and in 1 Corinthians 1! :1, “Follow my example, as I follow the example of Christ.” (1 Cor. 11:1), and then of course, the previously mentioned passage from Ephesians. Most of us have known someone who makes us want to improve ourselves in some fashion, to live differently, someone we want to pattern our lives after. And our desire to improve doesn't always stem simply from a desire for approval. We're confronted with an example of goodness so compelling that it lifts us right up along with it. We can all think about people who have set such examples for us. I have interacted with a number of people over the years that I wanted to imitate, most of them in the church. I was influenced by a significant number of them during my childhood. My grandparents both attended church, and I can remember going to their church when we’d visit during the holidays. We’d gather around an old pump organ during Christmas Eve and sing Christmas hymns, then head off to a midnight mass at the Episcopal Church in Benicia. I saw something in my grandparents that was attractive. I wanted to be more like them, my grandfather in particular. I would also add my mom as a great example of faith in my life- we would go to church almost every Sunday, as neither hail nor sleet nor would snow or rain nor monsoon, tornado nor hurricane could deter us from Sunday morning worship. She also read her Bible regularly at night. I knew Jesus was real for my mom and saw something in her that I wanted to imitate. Now of course by the time I was in high school, I found others who were not so Christ-like I wanted to imitate- guys who were really popular with the ladies, who looked, talked, acted in a certain way. They were cool and popular. I tried to walk more like them, dress like them, part my hair like them, etc., quite frankly without much success. I think my lack of success at being cool and a chick magnet had to do with those examples of the faith that had already given me an example to imitate. I had already been stamped with the mold of Christ, and those cool dude patterns just didn’t fit with the pattern I grew up with. Others throughout the years in various churches I attended or served, some seminary professors, and fellow co-workers in the ministry have been people whom I have patterned my faith after, and I give thanks for them all. Famous theologian and pastor Reinhold Niebuhr, son of a German immigrant, was born in 1892 in Wright City, Missouri. His father, an Evangelical pastor, was a remarkable man who read the Bible in Greek and Hebrew every morning and who reflected brilliance, piety, and human warmth within the family circle. Once asked why he also had entered the ministry Niebuhr replied, "I was thrilled by my father's sermons and regarded him as the most interesting man in our town. So what should I do but be a minister, in his image?” (taken from Wilderness Voices, by Bishop Armstrong, Abingdon, p. 65). We minister in Christ’s image when we imitate his way of living. If Paul were to write a letter to our church here today, and he knew the intricate inner workings of our lives, what would he say about our imitation of Christ, our example to others? Would the letter be complimentary or admonishing? Are we ourselves “Christ-like” in our interactions with others or Christ light- that is, “Yes I attend church on occasion, but you wouldn’t necessarily know it.”? Would one be able to tell we are a Christian simply by observation? Theologian Fred Craddock says, “If the messenger is not believable, neither is the message." Our denominational Book of Order says that the “mission of our church is to be a provisional demonstration of what God intends for all humanity, a sign in and for the world of the new reality revealed in Jesus Christ and a new beginning for human life in the world.” Would Paul call us an example to all the believers in Ashland, Talent, Phoenix, and Medford? If Paul were to observe a fellowship time and overhear our conversations, or to sit at a session meeting or go to a committee meeting, if he watched us in how we interact with the poor, would Paul see us as first-rate Rich Little-like imitators of Jesus, or C grade impersonators stuck in the Velvet Lounge far off the Vegas strip? Today’s passage should be a wakeup call, a time of personal introspection. How well do we demonstrate Christ’s love and message to the world? How Christ-like are we in our interactions with our friends and neighbors, in the workplace, on the road, at the store? Would someone notice anything different about us? Would they see the light of Christ in our eyes? What about at home, in our interactions with our spouses, our children, our family members? A person with some art training can attend an art show in a gallery in New York or Chicago of a certain artist, and can immediately spot the artist's style, and often his/her favorite colors. If such a person walked into the Art Institute in Chicago, the style of hazy and ghostly pallor in some Monet paintings, that person would spot the blue period paintings of Picasso and the wonderful realistic shadows and depth of Rembrandt. No art expert is needed for such observations. The style which is so unique comes through. So, too, of a Christian. 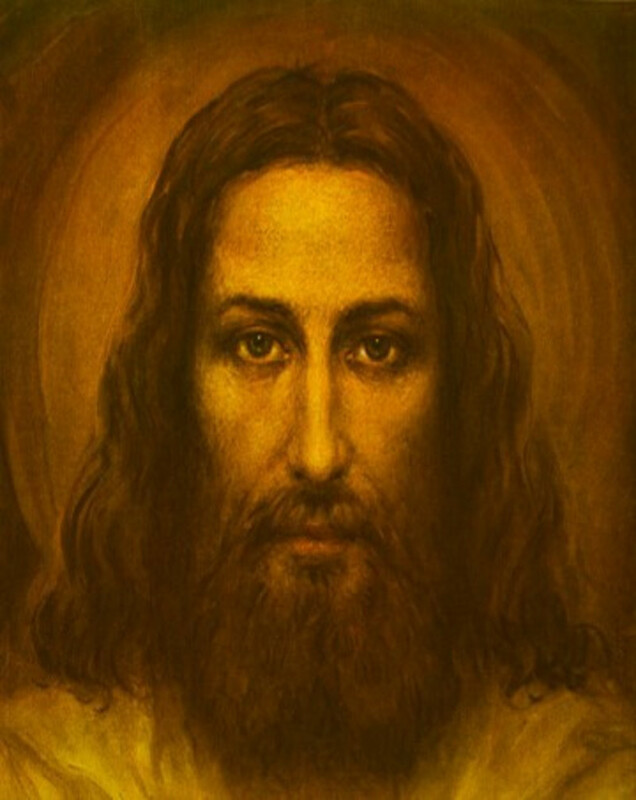 While a person's style may be unique, the likeness of Christ is supposed to shine through, so that everyone can say, "The person is a Christian; the image of Christ is there." If we indeed are good imitators of Christ, then we ourselves will be an example to follow, and we ourselves will help change the lives of others. American author Eugenia Price said, “If Christ lives in us, controlling our personalities, we will leave glorious marks on the lives we touch. Not because of our lovely characters, but because of his.” May we go from this place, as imitators of the one whom we are called to pattern our lives after- May we leave this place, as little Christs, offering up his love, his mercy, his justice and his compassion for the world, so that the world might be changed forever. Alleluia! Amen.